Part of Switzerland’s beauty is its easy-to-navigate and extensive train system, even with a rudimentary grasp of language and more luggage than a Kardashian on a weekend getaway. In fact, there were several times where getting on and off trains became a group activity that it was no wonder that Danke schön was my most commonly uttered phrase. Our destination was the mountainside village of Wengen. 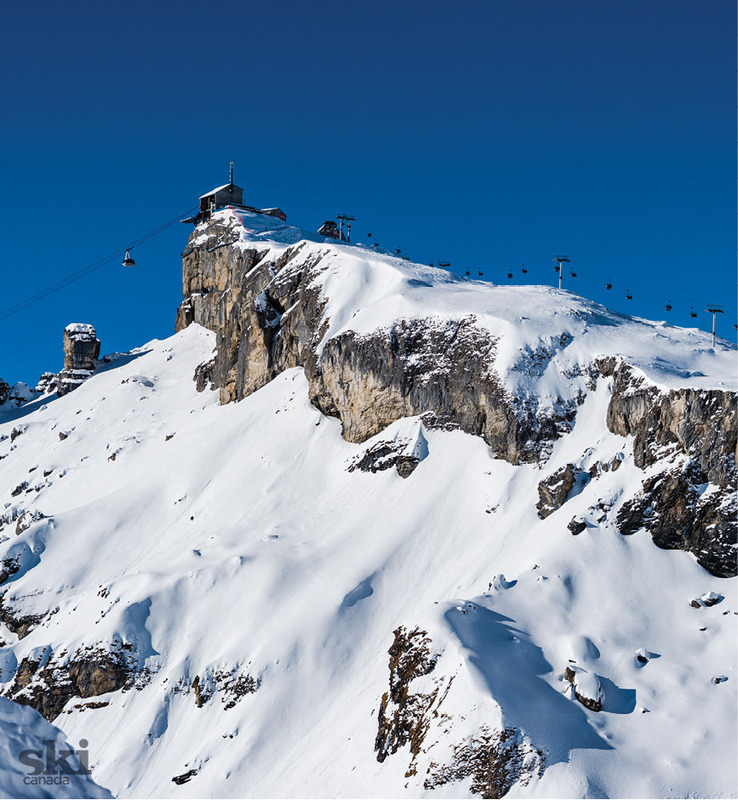 With its proximity to some of the most famous peaks in the Swiss Alps—the Eiger, Mönch and Jungfrau—it’s not hard to see why the area has attracted climbers, skiers and sightseers for more than a century. 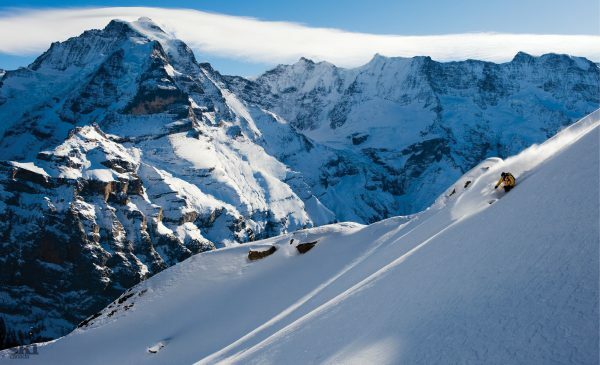 Indeed, Wengen is home to one of the oldest ski clubs in the world, the Downhill Only Ski Club, comprised of mostly British members who have been lured to the Swiss Alps since hobnail boots and wool trousers were the height of fashion. As we wrestled our gear off the train and contemplated how far we might have to drag it through the car-free village, we spotted our accommodation, the Hotel Silberhorn, about 50 steps from where we were standing, no porters required. We couldn’t have asked for a better HQ to explore the Jungfrau region that aside from Wengen, also includes Grindelwald, First and Mürren. The main cable car in Wengen was a short walk from our hotel, and our room overlooked the famous train station and the cliffside village of Mürren, across the valley where some of the area’s toughest and best freeriding is but our short stay meant we had to leave it for a return visit. Wengen has managed to maintain a quiet feel, probably because of its lack of accessibility by vehicle. Guests coming to the slopeside town in winter need to park in Lauterbrunnen down in the valley and take the 15-minute train ride up to Wengen station. But I’m sure the tranquil alpine volume changes in early January when the Lauberhorn World Cup downhill comes to town. Especially last winter, when the race was won by local favourite Beat Feuz. Whenever a Swiss racer is on course, the cowbells are ringing loud and proud. One of the things that makes the Lauberhorn an iconic racetrack, apart from the leg-burning length of the course, is the fact racers must thread a needle through a narrow S-bend section, not much wider than a couple of cat widths, before rocketing through the Wasserstation train tunnel. Race superstition says it’s good luck if there’s a train overhead when a racer passes through. As a lifelong race fan, standing on the ridiculously steep slope above the train tunnel, contemplating hitting the opening at full speed, was nearly enough to make me need a change of ski pants. After a morning exploring the lower Mannlichen area toward Grindelwald, it was time to head upward and see if we could find the racecourse and the ski-out down to Wengen. After a couple of misfires, it was time to admit defeat and break the cardinal rule of manhood: ask directions. Luckily, I chose to ask the kindest person in Switzerland. Manfred and his family have an apartment in Wengen and instead of just giving us directions, he and his kids became our afternoon tour guides. They showed us the best sections of the Lauberhorn, we took pictures together and, at one point, I think we even planned a summer holiday with the family. Alas, parting was such sweet sorrow, and Lora and I said goodbye and finished the day on the back steps of the Silberhorn, ski-out success achieved. I’ll admit, I was impressed with the skiing, but I was in total awe of the Eiger. I’ve had a thing for it since seeing the 1970s Clint Eastwood film, The Eiger Sanction. There’s a scene in the movie where Clint is sitting in the Hotel Bellevue des Alpes, in Kleine Scheidegg, contemplating climbing the north face of the Eiger. That scene was how I pictured all of the Alps for years afterward. I needed to see that view for myself. 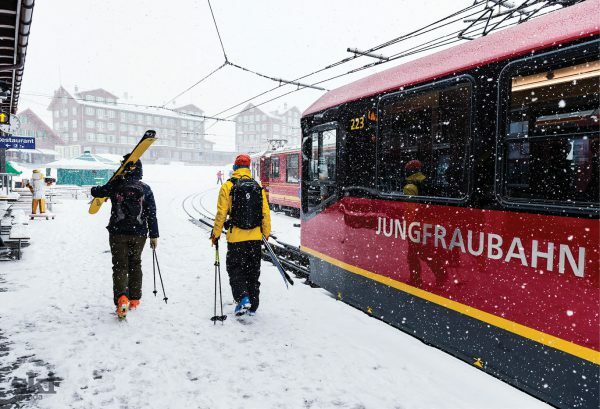 Luckily, there is the Jungfrau railway that takes visitors from Wengen to the Jungfraujoch, a high-alpine saddle between the Jungfrau and Mönch mountaintops. The train stops along the way at the Scheidegg Pass, in sight of the historic hotel. The narrow-gauge railway is a feat of engineering that required tunnelling through the Eiger and Mönch, before exiting at an impressive 3,400m on the Jungfraujoch. It was built at the end of the 19th century, mostly by Swiss and Italian labourers, over a span of about 16 years. From the top visitors are offered some of the most expansive views in the Alps, as well as a memorable one straight down the mighty Aletsch Glacier, the largest in Europe. The top station is also home to the Sphinx Observatory, which has been a scientific research station since the ’30s. The whole setting looks like a lair from a James Bond movie, but it was actually across the valley that George Lazenby as 007 was on Her Majesty’s Secret Service in 1969. 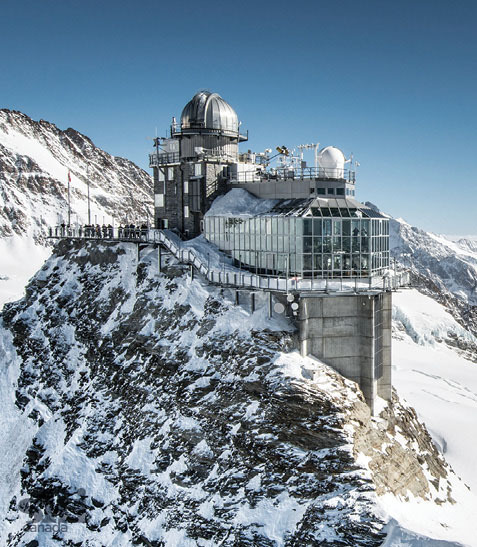 Blofeld’s evil lair in the film was Mürren’s mountaintop Schilthorn and today’s shrine to the world’s most famous spy is a worthy 20-minute distraction between runs. After playing tourists, it was time to get back to playing skiers. Our Japanese guide Yukiyo convinced her Swiss-Canadian husband, Alex, to join us for a day in Grindelwald. The couple and their two daughters settled in Switzerland after living for a time in Canada. They knew the ski area like it was their backyard, mostly because it was their backyard. Lora and I skied from Wengen and met Yuki and Alex in Grindelwald. Together we explored everywhere the conditions would allow, and a few places we shouldn’t have, after foolishly following Alex to some of his favourite stashes. From Grindelwald, Lora and I caught the train back to Wengen, just in time for a soak in the spa and a final memorable five-course meal in the Silberhorn dining room. In the morning it was back to Canada, back to reality. Our last memory of Switzerland was watching the landscape of the mountains turn to the clean and tidy urban landscape of Zurich. Our last train ride ended at the airport, where we narrowly avoided a multitude of flight cancellations because of the uncharacteristic cold snap that had settled over Europe. Our lasting impression of Switzerland? Trains are definitely good luck—and to more than just downhill racers. • Air Canada has daily service from Montreal, Toronto or Vancouver to either Zurich or Geneva. • The easiest way to get around is a Swiss Rail pass, www.sbb.ch. • Hotel Silberhorn in Wengen, one week per person with HB (breakfast and dinner) from C$525, www.silberhorn.ch. • Six-day lift pass for Wengen, Grindelwald, First and Mürren, C$372 if bought online 21 days before the start date. • For more on the Jungfrau railway, the Top of Europe or the First Glider, www.jungfrau.ch.